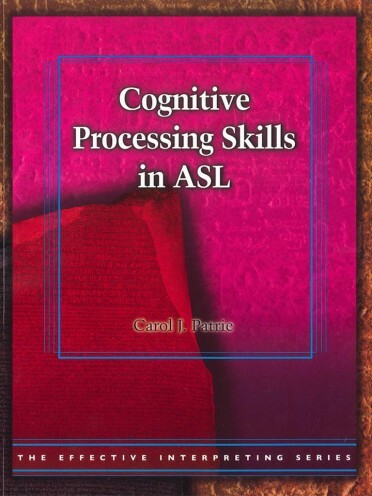 Cognitive Processing Skills in ASL helps you develop what Dr. Patrie refers to as "the invisible mental processes that are essential to the interpreting process." 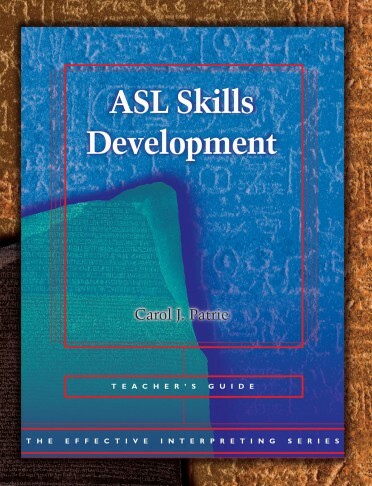 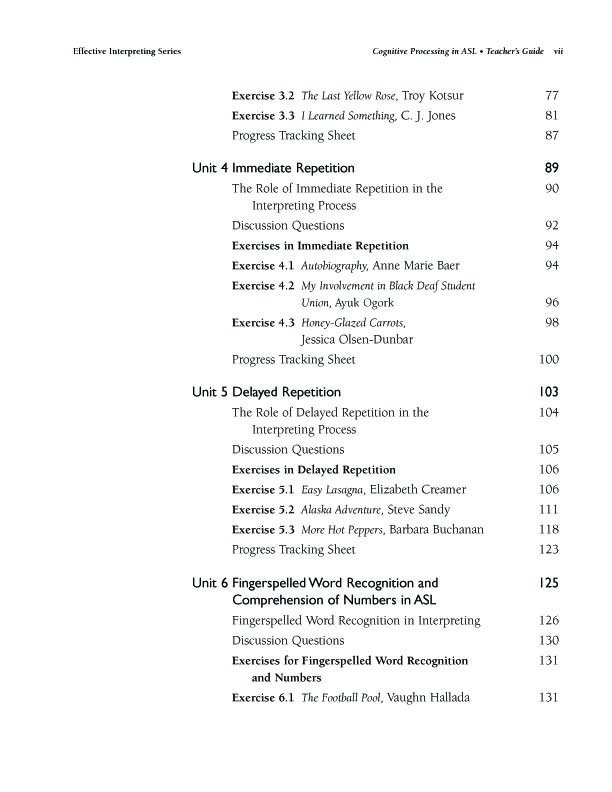 Each of the skills sets covered in this volume are developed within one language, ASL, giving students a language depth and flexibility necessary to build their confidence in ASL comprehension. 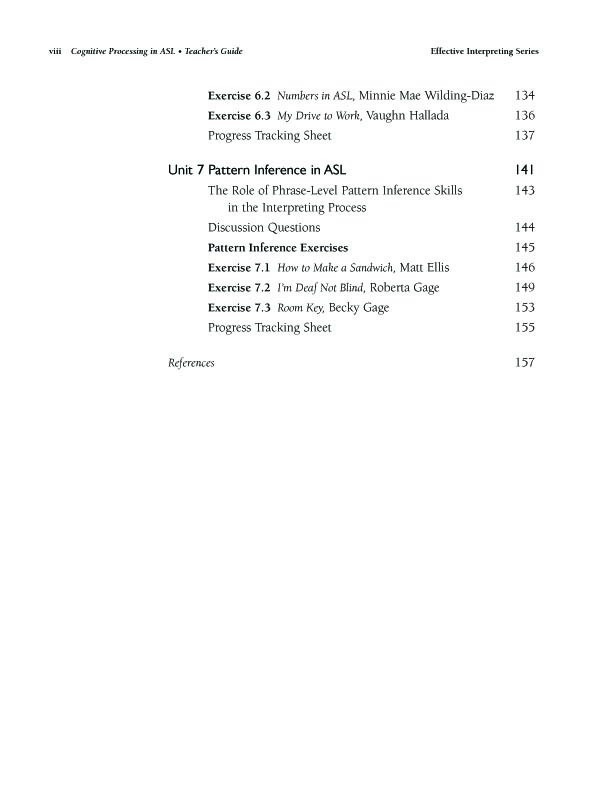 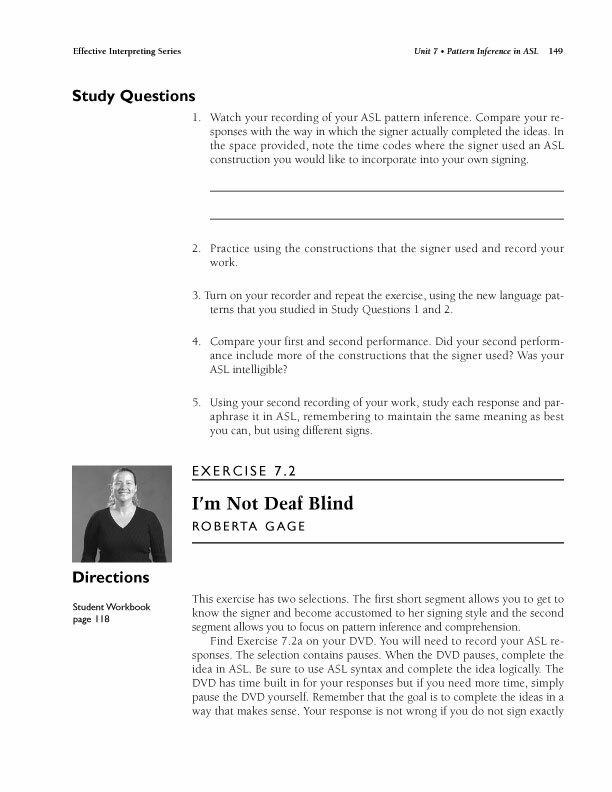 Each lesson utilizes ASL source materials on the DVD that are divided into manageable clips, which increase with difficulty as you progress in each level. 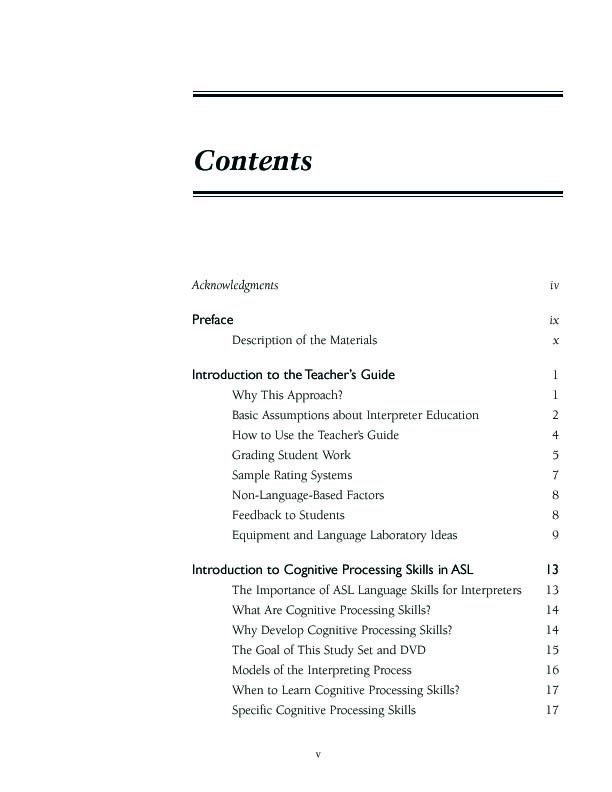 Mastering these skills will enable your students to increase their comprehension and decrease errors in interpreting, making the process as effortless as possible. 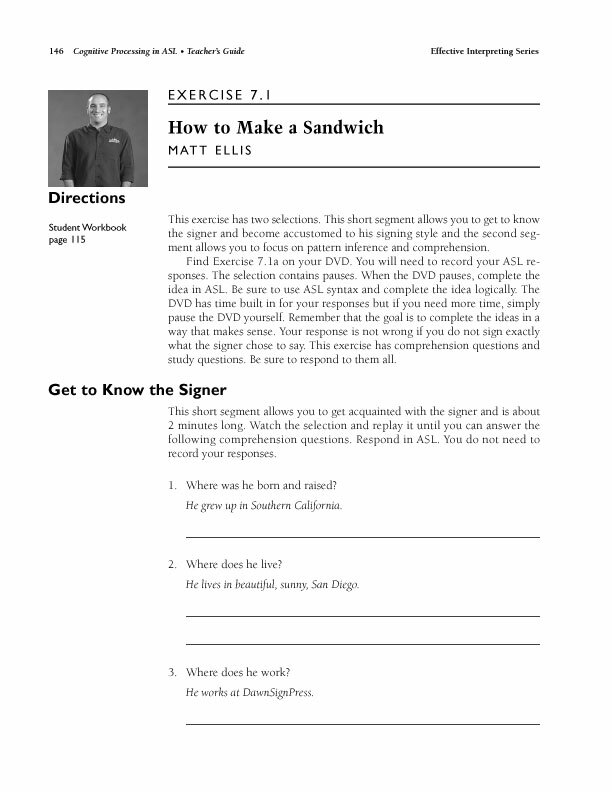 Added features in the teacher's guide make this a comprehensive teaching tool. 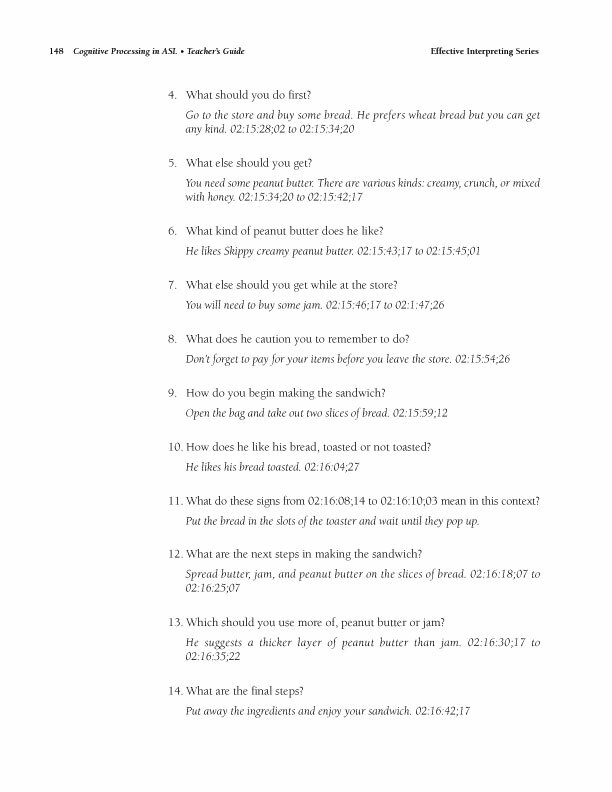 Teachers are provided with examples of appropriate responses to the questions in the student's workbook (shown in italics). 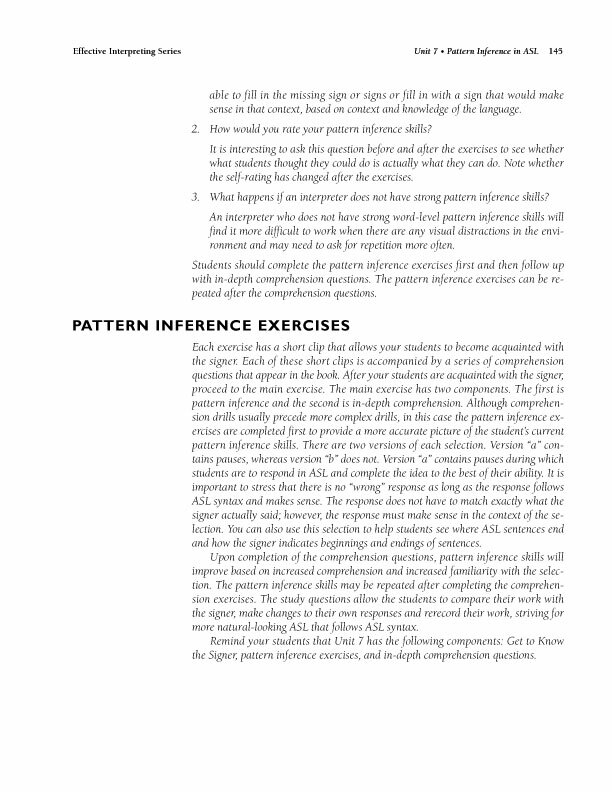 Also in italics are additional teacher's notes providing tips to the instructor for optimal use of the materials. 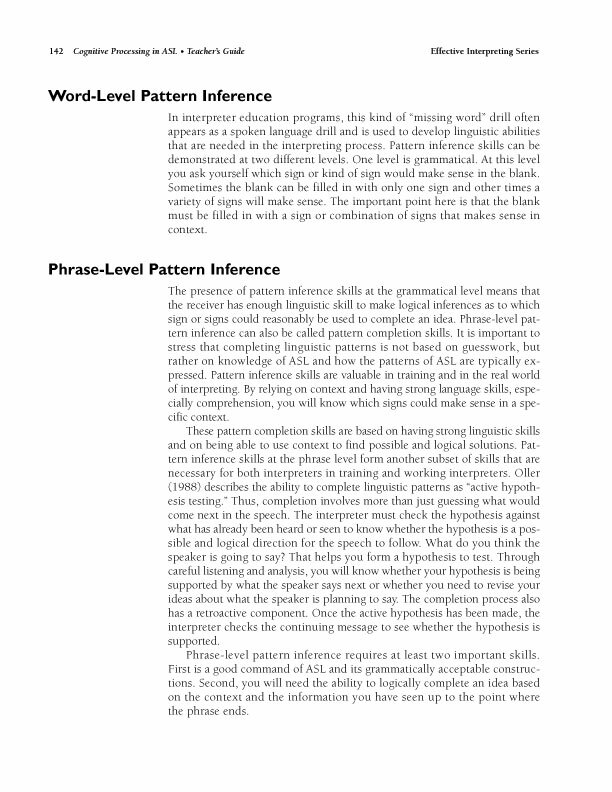 A valuable Five-Step Follow-Up section, following each lesson, reinforces everything the student has learned. 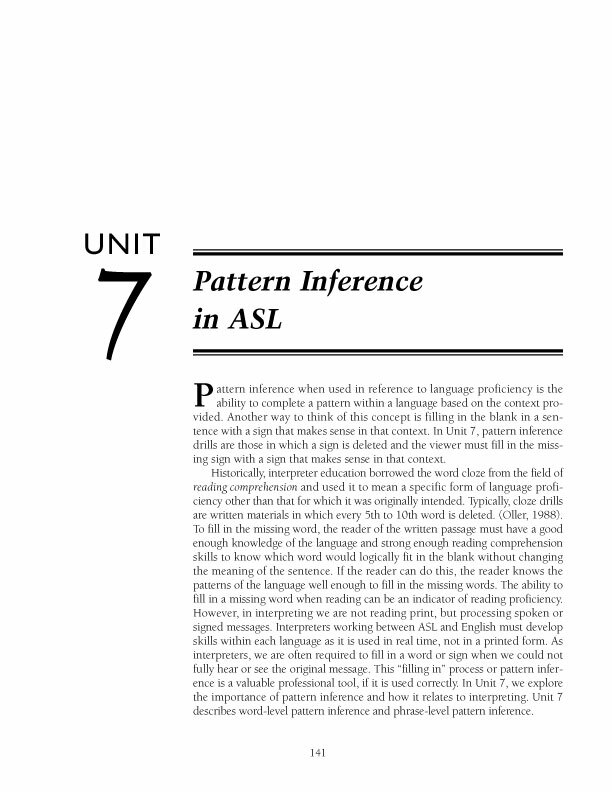 The Effective Interpreting Series is a multi-installment series offering five sets of source materials in English to use with any language in a language pair, and five sets of source materials in American Sign Language (ASL). 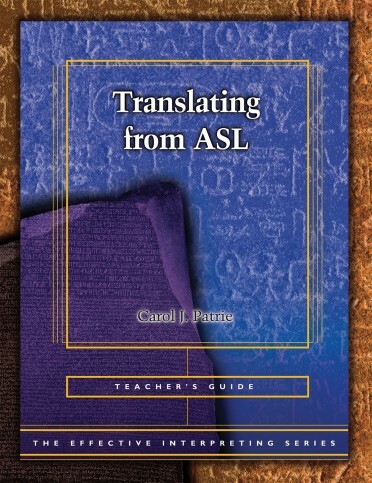 The series takes the complex skills of simultaneous interpreting and breaks it down into manageable components, allowing interpreters to increase the individual skills that lead to effective simultaneous interpreting. 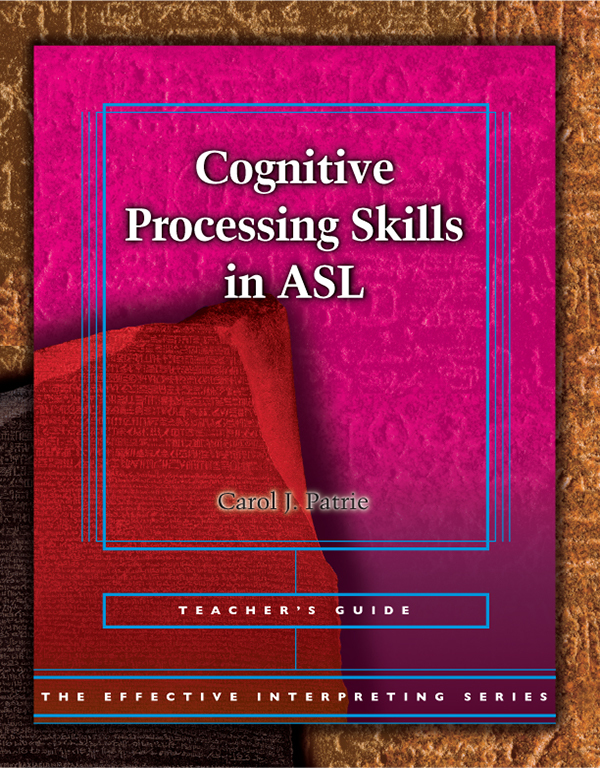 Use this innovative step-by-step approach in the classroom to improve students' ASL skills and turn out more effective, and confident interpreters. 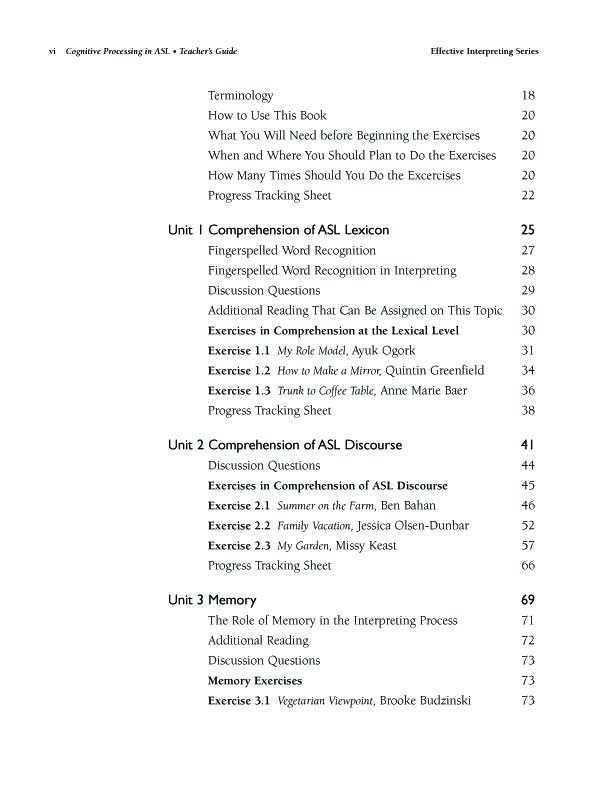 Teacher Trainings AVAILABLE for The Effective Interpreting Series! 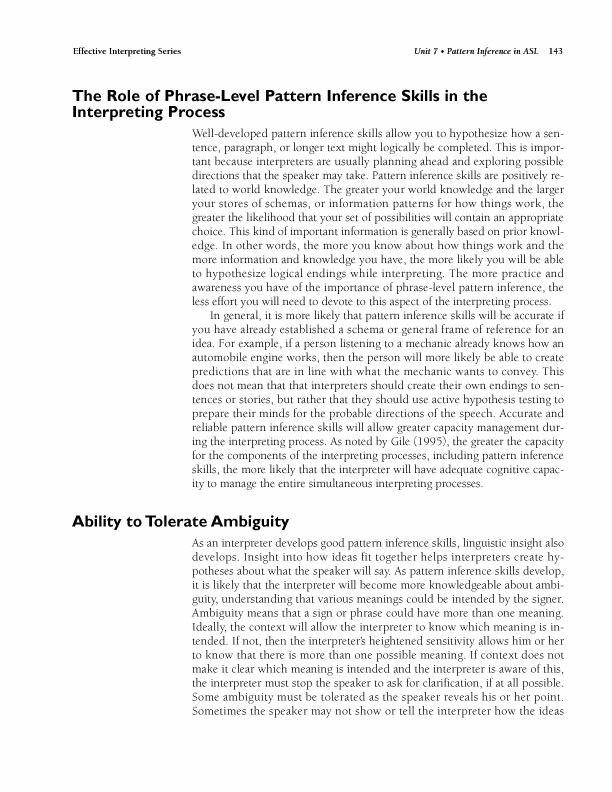 If you are interested in hosting a training for your college or university, please send an email to Joe Seifrid at effectiveinterpreting@dawnsign.com for complete details. 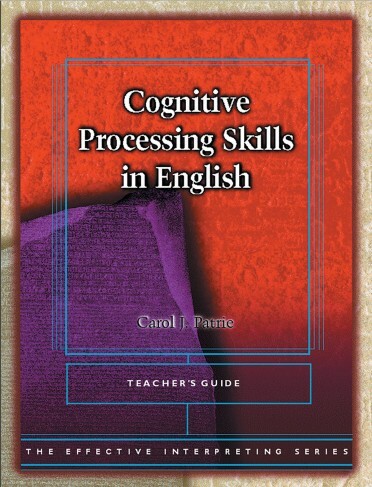 For information regarding credit-bearing courses, please go to: http://www.carolpatrie.com/training.html.